My name is Capt Eddie Oliveras, sole owner and operator of CANA Sportfishing/NSB Fishing Charters LLC. I'm a USCG licensed and insured captain born in Bayamon, Puerto Rico and raised in Central Florida fishing all my life from the cane pole to the fly bridge. I'm married, 36 years old, father of a 6 year old girl (Naomi) and 4 year old boy (Julian). I personally own, maintain and manage the boats, tackle and business full time since 2015. In the rainforests of Puerto Rico catching freshwater crabs and prawns on the river… be home by sundown or deal with Abuela! I became a captain after the successful sale of my tackle store in 2015, where I spent every day fulfilling the fishing dreams of others… It was my turn. Fishing all my life, I was fortunate to travel from the Caribbean to the Pacific and across the world. Fisherman in other destinations have all found their trusted techniques to fool fish that I apply every day. I don’t fish like everyone else, if it works there it might work here, so R&D is a big part of my fishing program to find the best rigging, techniques and most importantly presentation. That means how we fish not just where we fish is just as important. A great fishing platform coordinated with precision boat handling and an experienced mate are critical to success and I’m fortunate to have both to offer my charter clients. Tournament wins and magazine write-ups have helped push us to the top. Fish with us and become part of the family in Islamorada in the Florida Keys. My business career started with my love for aircraft and design getting admitted to Embry-Riddle Aero University in Daytona Beach, FL. Our family was devastated to discover my mother had terminal breast cancer and studies became that more difficult commuting home to be with them. God blessed us with keeping our family together and I stayed in Orlando thereafter, as a CAD tech and designer in the civil/survey field. I started my first corporation in 2002 and have been in the engineering/hi-tech field up until I was financially free to check out of the rat race and relocate my young family to New Smyrna Beach, FL. There I purchased the tackle store, polished my resume for the toughest most demanding job of my life… becoming a great charter boat captain. It is my lifelong dream to take you fishing, I do not ever take it for granted. What the store looked like when I took over. We quadrupled sales in 1.5 years and sold at 4x multiplier, simply because of customer service! 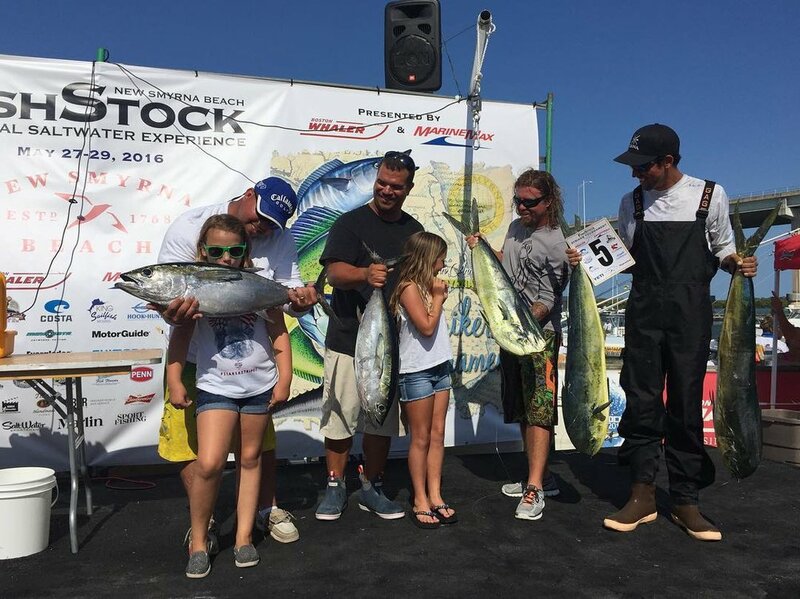 Coming in strong with Top Tunas and mahi’s along with sailfish release! I’m blessed to be mentored by many great guides and charter captains like Ty & Cody Moore, Chuck Miller, Chris Walter, Flip Pallot, Alex Adler, David Workman, Cas Summers, John Tarr, Kill Bill, Mike Nelson, John Lloyd and of course my experienced mates that without them it would not be possible. It is my honor the opportunity to provide you with a safe and memorable fishing experience. I promise to treat every soul on board like family and do my very best to keep the rod bent. We now offer a couple options for fishing charters. A 23' SeaCraft center console or our 32' Luhrs Open. 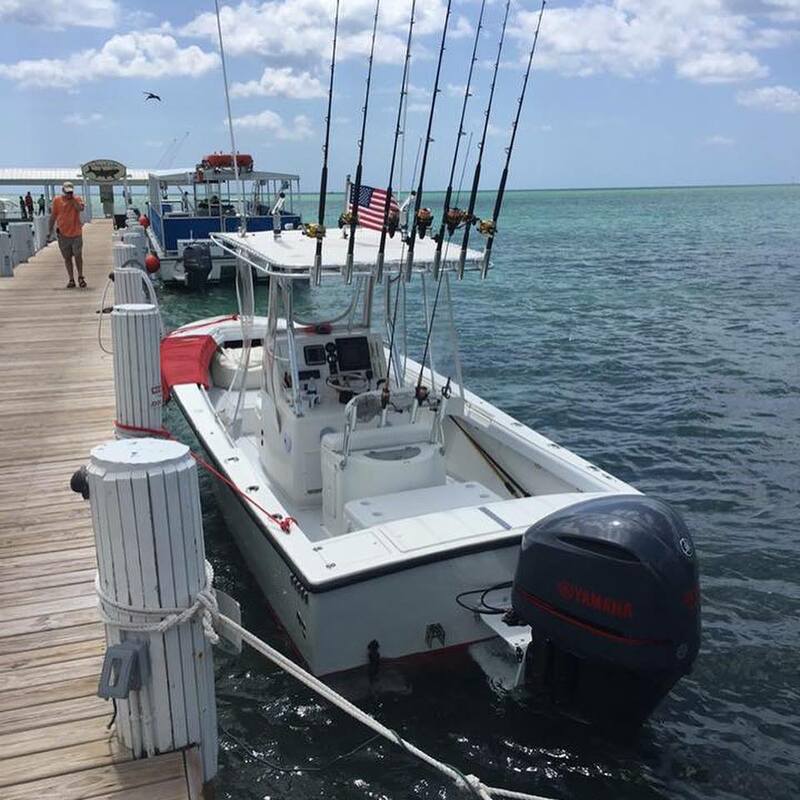 For groups up to 6 anglers, you'll be fishing aboard the CANA (pronounced "kah-nah"), a private sportfishing yacht based in Islamorada, Florida. This vessel, a 2003 Luhrs twin-engine turbo diesel sportfishing yacht powered by inline v6 totalling 630 hp Yanmar (Toyota) built in St Augustine, Florida is designed for deep sea big game fishing and cruising with an express layout, dual station fly bridge, trolling outriggers and a wide 13 foot beam. Once aboard you will find plenty of seating and a clean interior cabin, with private head, shower and galley. The main deck keeps all passengers in shade, dry and comfortable should we encounter weather. The large bow area serves as a great picnic and lounging spot for our booze cruise on anchor when you'd rather catch sunshine than fish. Custom JL Audio sound, full Strataglass curtains, ride in comfort! This "Potter-built" custom 1977 Seacraft hull was restored by Capt Chris Walter in Islamorada, FL used as his personal charter boat for many years and thousands of trips traveling all over the Florida Straits and the Caribbean islands. His attention to detail means, you're fishing aboard a sound vessel, one having safely ferried thousands of people to deep ocean, specifically built for charter fishing, using over-built over-engineered hardware to withstand the toughest fishing conditions. Custom livewell systems, the latest electronics and every component was custom built to order. I'm proud to offer a day in the ocean on one of my favorite boats I've ever ridden on, I'm sure you'll see the fit and finish is second to none. At only 23 feet and single engine power, understand, the reliability of today's engines and the pedigree of the classic 23 SeaCraft means there's few boats I'll ever feel safer in the ocean riding in any sea. She fishes bigger than she looks, bone dry ride with custom curtains, electric hookups for deep dropping, custom hydraulic engine bracket and steering, this is the Ferrari of 23 ft center consoles. but we of course allow you to smoke if you wish. When you book you can request any specialties like cigars, drinks, catered meals (48-hour advance notice required on meals). I've chartered many boats before being a captain and unfortunately many crews feel the need to shout or yell on a trip or behave rudely. This will 100% absolutely NEVER happen on my boat from my crew or myself. As professionals, we will try to coach and offer assistance when needed but everyone gets our utmost respect and courtesy as this is YOUR boat for the day. Our custom expeditions are designed around your individual needs and desires. When you step aboard, you'll find an immaculately cleaned boat with dry cushioned seating. Some charter boat operators run their own program around what's nearer to shore to burn less fuel, and easy to catch. They offer a No Fish No Pay Guarantee - often that means "any fish" counts and when you see this that's a red flag! Booking with us means, if you wish to catch a certain variety of fish, we will ask you first and discuss what the fishing conditions and seasonal variables are to be successful. This is much more challenging... and we like it that way. Lots of room for you and your friends and family! Relax in shade while jamming to custom JL Audio sound system in style. As a full time owner/operator I can make decisions on these trips to make your day a lifelong happy memory. With fishing, the thrill is there are no guarantees the fish will bite, however, if one spot doesn't pan out, we burn the extra fuel and cruise at higher speeds to find more productive waters and add more fishing time. I always leave the dock with extra baits and rigging for when the fishing is on fire. Our business relies on repeat customers, we won't quit until the fish box is full! Fish with us and join our growing family of satisfied anglers. Just read to see our PERFECT FIVE-STAR reviews on Trip Advisor, Facebook and Google! Our specialty is guiding families to create lifelong memories - your first time offshore, or your first billfish landing... we will help and coach you to land your fish of a lifetime! From 8 years to 88 years young, lets go fishin'! Bring the kids with you, I promise they will be talking about their fishing trip all summer! I pay personal attention to our young anglers to keep them involved with what we're doing and how to catch and fight fish. The little ones are our future!